Hi crew: Scientific ocean drilling is much different than other means of sampling seafloor sediments. For example, box cores, gravity cores, piston cores and the like collect a single core or sample of sediments. The JR, on the other hand, is capable of taking continuous cores through sediments,sedimentary rock, and/or ocean crust. It does this by taking cores 9.5 metersat a time. Inside the hollow drill pipe, latched in just above the drill bit,is a 10-m long steel core barrel that contains a clear plastic core liner. After coring has advanced 9.5 m into the sediments (or rock) a winch lowers asteel cable, with a special tool at the end called the sinker bar, down thecenter of the drill pipe. The sinker bar latches on to the top of the corebarrel. The core barrel and its sediment (or rock) filled core liner are hauledup to the surface. 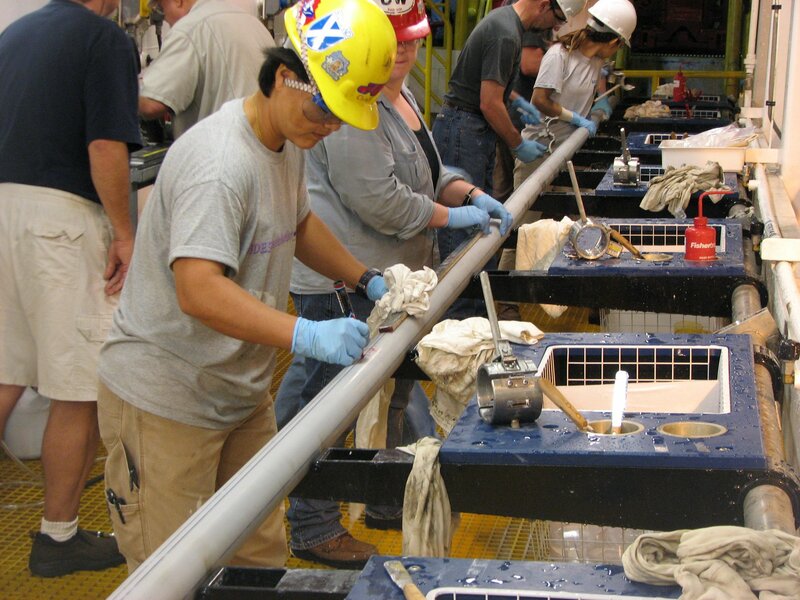 The rough necks extract the core barrel out of the drillpipe and lay it horizontally on the rig floor. They then unscrew the end of the core barrel, called the core catcher (which keeps the sediments from sliding out of the core liner as the core barrel is lifted up the drill pipe), and then extract the plastic core liner and contents. The rough necks pass the 9.5-ml ong ‘spaghetti’ of material to a group of awaiting marine technicians on the catwalk (core receiving area), who then lay the core out on specially designed hangers.Today’s photo shows the marine techs measuring and marking the core liner into1.5 m sections numbered down from the top. They use specially designed cutters,which clamp onto the core liner and are then spun around to cut all the way through the plastic (you can see the silver cutters in the photo and someone about the clamp on a cutter in the distance). Plastic end caps are then affixed with acetone to both ends of each section, blue for top and clear for bottom. In the meantime, the rough necks have fed an empty core barrel and core liner into the open end of the drill string and let it free-fall in the drill pipe to the bottom where it latches into the drill bit and the process begins again.